Kathmandu airport was surrounded in pea soup fog the morning we were to fly to Lukla and begin our 20 day Everest Base Camp Trek. After waiting patiently for 4 hours we were very disappointed to be told the flight had been cancelled and that we were to return the following day, hopefully with better luck. There is plenty to fill your day in Kathmandu. The country’s capital Kathmandu and largest city simultaneously reeks of history and the wear and tear of increasing modernity. The tightly packed historical centre, with its squares and temples, continues to preserve a world light years away from shantytowns, expensive hotels, restaurants and shops on the city’s outskirts. Kathmandu’s core is Durbar Square, with the Vishnumati River to the west and Ratna Park to the east, The Bagmati River forms the southern boundary, whilst Thamel, the popular tourist hangout sprawls to the north. This would have to be one of the most exciting cities in the world today. The following morning we arrived at the airport at 6am only to be greeted with the air strip once again engrossed in fog. Fortunately, by 10am the fog lifted and the flights started to take off one after the other carrying many excited trekkers to their destination. At last our flight was called --- Yeti Airlines 734. We were taken out by bus to the waiting plane, only to find 3 mechanics crouched looking worried. The front wheel was sitting in a puddle of oil, we did not have to ask what was wrong, it was obvious there was a problem with the hydraulic system. Departing on time looked bleak and I noticed the pilot was starting to get anxious as the weather was once again beginning to close in and the wind had picked up. 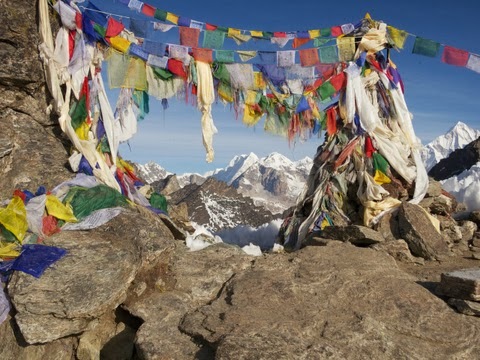 I have flown to the Everest Region on numerous occasions and I knew what this meant. We only had a short window and it was fast closing. If we did not take off soon we would be grounded once again. After 1/2 an hour we were finally on our way, but I was very nervous as we were the last flight to leave Kathmandu airport and the weather was deteriorating rapidly. The flight takes approximately 40 minutes, within 20 minutes we will have reached the notorious Lumja Pass were the wind is usually at full strength, you feel like you are in a washing machine being tossed, as the plane tilts sideways. I looked out of the window and all I saw was a heavy layer of thick grey cloud. Our guide was sitting next to me holding his prayer beads and praying to both Buddha and the Hindu Gods at the same time. God I hope it works. 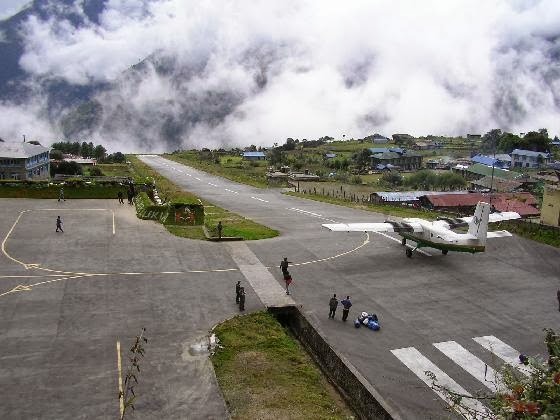 Flying into Lukla airport, classed at the world’s most dangerous airport, is an unforgettable experience. From the aircraft it is hard to see the air strip as it is at a 45 degree angle, thank goodness everyone was concentrating on the sheer beauty of the scene below, not noticing what was ahead. The snow-clad slopes give way to beautiful forests of pine and rhododendron, and just below the tree line, verdant valleys and white-water rivers give way to fields of green. There is a sense of timelessness as the plane makes a perfect landing and the front wheel holds out to the end, this was one unforgettable flight. For us the remainder of the trek was mostly hazard free, and we were blessed by the Gods with fine weather every day. Our first acclimatization days are spent at Namche Bazaar, home of the legendary Sherpa people. This colorful village was once the main trading post between Tibet and Nepal and offers a unique insight into the traditional Nepali way of life. On this 20-day trek we also visited the famous Buddhist Monastery at Thyangboche which has been restored after being destroyed by fire in 1989. 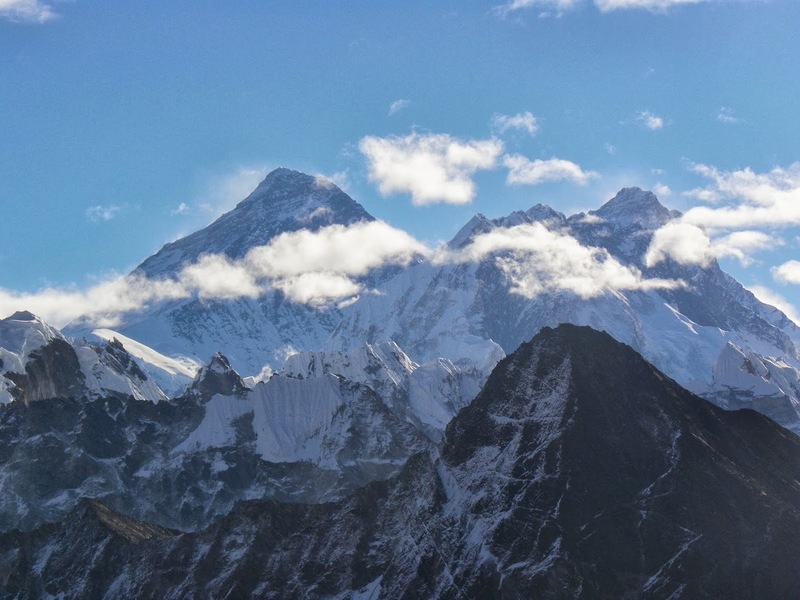 Thyangboche is surrounded by some of the most beautiful mountainous scenery in the world and majestically towering above is Ama Dablam. 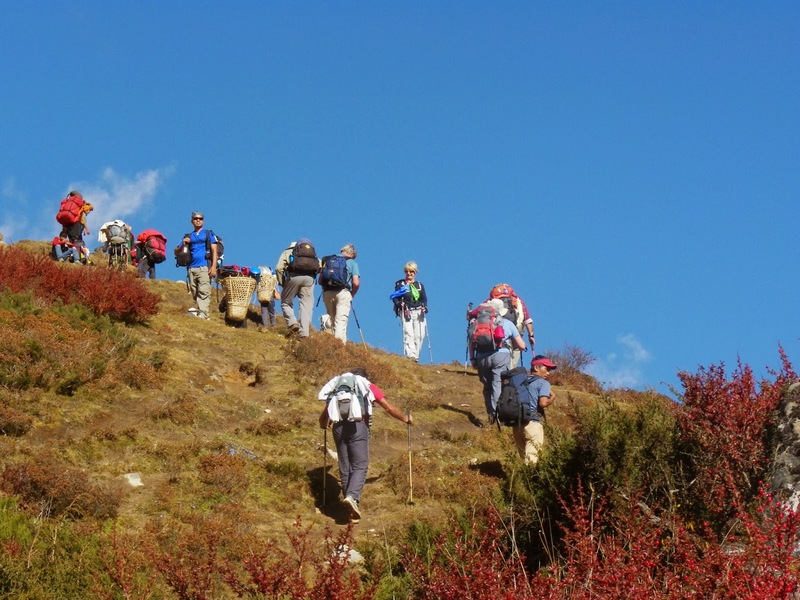 As we climb steadily northwards we continue the acclimatization process whilst following the mighty Khumbu Glacier to Kala Patar. This rocky outcrop opposite Everest (5623m) is the highest point of our trip. Here our efforts were truly rewarded with an awesome 360 degree panorama of the world's most spectacular mountains. 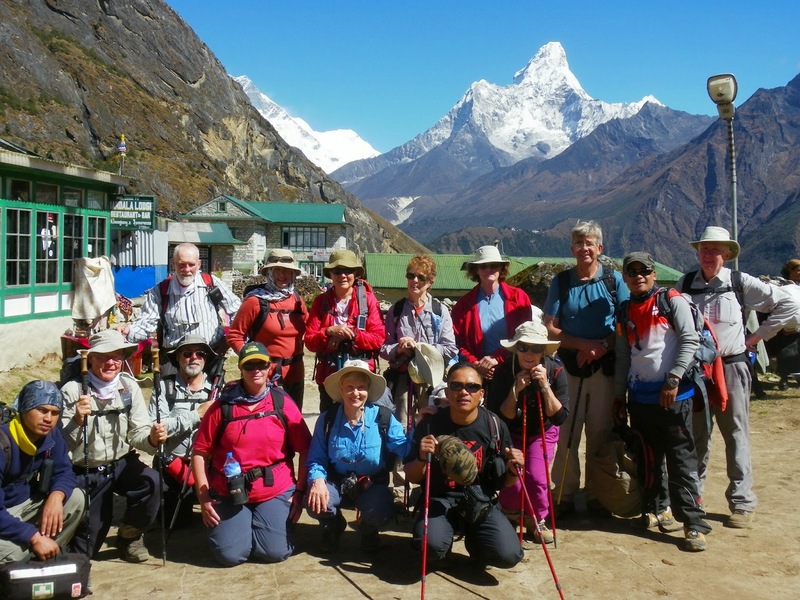 The weather was perfect the afternoon we hiked to Kala Patar to wait for the sun to set on Everest. It is hard to imagine that you are looking at the highest point of land mass on earth, that many a mountaineer hungers to climb. 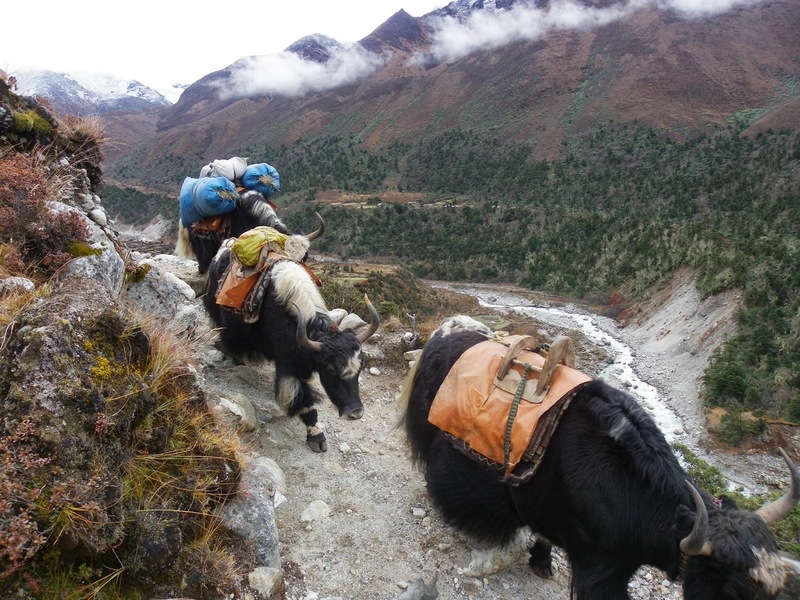 The following day we take a long hard hike to Everest Base Camp, unless you are there when the expeditions are getting ready to climb, then Everest Base Camp has nothing to offer. It is a barren mass of rock and ice and contrary to what people believe there is no view of the summit of Everest. Camping at altitude is difficult especially at -150 at night. If you are well prepared with Gore-Tex gear and fleece, a good sleeping bag, and you can negotiate peeing in a bottle, and remember to knock the ice off the inside of the tent onto your space blanket before sitting up, then you will not have a problem. Oh! You also require a good sense of humor. After a truly awe inspiring trek we make our back down the mountain to Lukla for our return flight to Kathmandu only to be told that the weather had closed in and that we could be delayed. Three days later we arrived in Kathmandu for a beer, hot shower and warm bed in that order. Lyn Taylor’s Adventure Travel specialise in Group Adventure holidays, Women's Travel Tours & Family holidays that are tailored towards people looking for something different.